Upon arriving at Marseille France we were greeted at the dock by two vans that drove our group to the top of a steep hill in Provence. Along the way we passed the Marseille Cathedral and were able to see the Château d'If, made famous by Alexandre Dumas' book, The Count of Monte Cristo. Once we reached the starting point for our bike ride we were given a little time to take photos and then we were each given a bicycle and a helmet. When everyone had their equipment and felt comfortable with their bike we started down hill. Due to the steep incline I was able to gather quite a bit of speed. At one point I was going so fast that my handlebars started to vibrate which I decided was too fast and slowed down. Along the way there were many scenic areas so we stopped frequently to take pictures and allow others to catch up. Unfortunately towards the end of our ride Leah tried to stop a little too quickly as she approached a group who had stopped at a viewing area and applied too much pressure to her front brakes causing her to flip over the handlebars. Luckily she wasn't seriously injured, but she did have some nice abrasions and a few bruises. After arriving at our meeting spot towards the bottom of the hill a group of us decided to hike down to the water front where the town of Cassis was located. 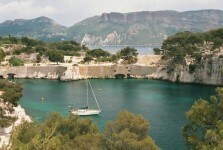 Cassis is a small fishing village and is absolutely beautiful. We didn't stay long since we needed to go back up the hill to where the vans were so we could go for lunch. Once we got back to the vans, we drove to what I think was the Calanques. The Calanques are huge folds of limestone rock found between Marseilles and Cassis which as well as offering some of the most spectacular scenery in the south of France have created a string of deserted coves all along this part of the Mediterranean. As we started our walk I could see a very narrow natural harbor filled with many sailboats. The view was simply breathtaking. After hiking a bit to a good picnic spot our guide set up a picnic consisting of various local wines, cheeses, breads, fruits, and spreads. I found the food quite enjoyable. There was a spread made from anchovies that had an interesting taste. I also thought the brie was quite good. After lunch, we drove back down to Cassis where we had some more time to shop and explore. Aaron and I decided to walk along the water front to the lighthouse. This was a nice spot to just sit and relax. From the lighthouse we were able to watch tour boats go in and out of the harbour and had a great view of the cliffs over Cassis. It was too bad we couldn't stay longer because I could have just sat there all day.